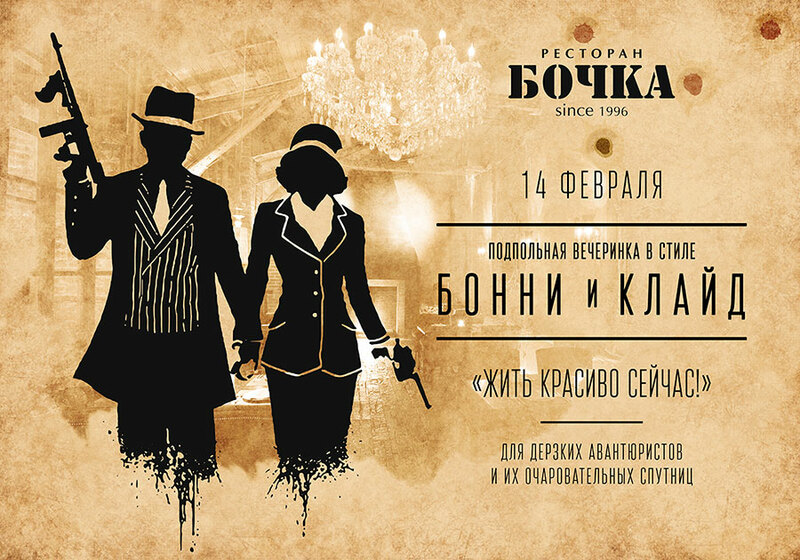 On February 14th, an underground party in the style of Bonnie & Clyde for daring adventurers and their charming companions in “Bochka” restaurant. You will be greeted by our waiters looking like Bonnie and Clyde who will serve you, together with a fresh issue of Gangsters’ todaylove-story newspaper, an unusual compliment, which is an aperitif – cocktail “King of bootleggers” served in a coffee cup – it’s Prohibition time, after all. You will not escape from paparazzi, but you’ll have photos in the wanted style as mementos, and you will have to break the law while hiding a glass of whiskey or wine from the security forces. Even if you do not consider yourself to be a gangster, you still have a real chance to get a safe with all its content – every guest will take part in an unusual lottery. We guarantee that no one will leave without a prize this evening. Recommended dress code: Bonnie & Clydestile. * The underground club serving alcohol.